This graphic, from the Spring 1996 issue of Blackjack Review magazine is one of my favorites. This graphic was created in the 1990’s, so take that into consideration when viewing. The eyes are a card counter’s most valuable resource… they watch everything (e.g., the cards, deck penetration, dealer errors, pit actions, signs of cheating, etc.). Some players have custom eye contacts designed for perfect vision at 5 to 10 feet. 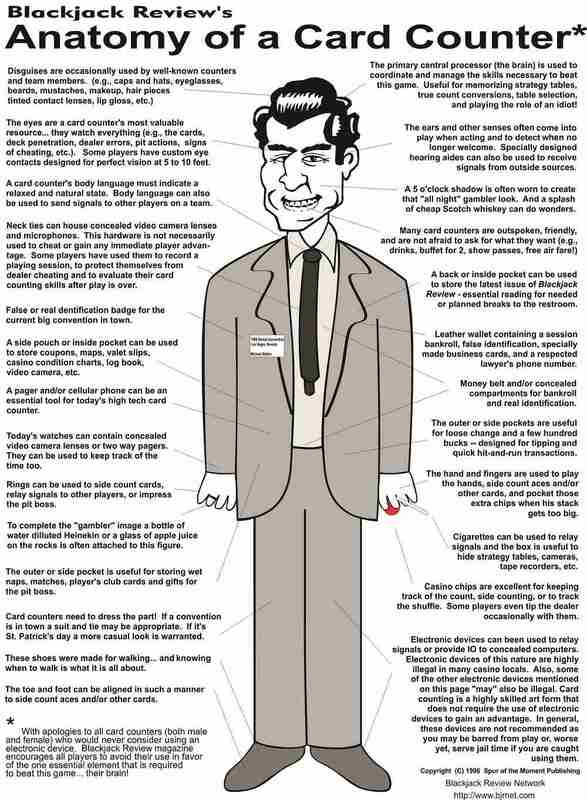 A card counter’s body language must indicate a relaxed and natural state. Body language can also be used to send signals to other players on a team. Neck ties can house concealed video camera lenses and microphones. This hardware is not necessarily used to cheat or gain any immediate player advantage. Some players have used them to record a playing session, to protect themselves from dealer cheating and to evaluate their card counting skills after play is over. False or real identiﬁcation badge for the current big convention in town. A side pouch or inside pocket can be used to store coupons, maps, valet slips, casino condition charts, log book, video camera, etc. A pager and/or cellular phone can be an essential tool for today’s high tech card counter. Today’s watches can contain concealed video camera lenses or two way pagers. They can be used to keep track of the time too. Rings can be used to side count cards, relay signals to other players, or impress the pit boss. To complete the “gambler” image a bottle of water diluted Heineken or a glass of apple juice on the rocks is often attached to this ﬁgure. The outer or side pocket is useful for storing wet naps, matches, player’s club cards and gifts for the pit boss. Card counters need to dress the part! If a convention is in town a suit and tie may be appropriate. If it’s St. Patrick’s day a more casual look is warranted. These shoes were made for walking… and knowing when to walk is what it is all about. The toe and foot can be aligned in such a manner to side count aces and/or other cards. The primary central processor (the brain) is used to coordinate and manage the skills necessary to beat this game. Useful for memorizing strategy tables, true count conversions, table selection, and playing the role of an idiot! The ears and other senses often come into play when acting and to detect when no longer welcome. Specially designed hearing aides can also be used to receive signals from outside sources. A 5 o’clock shadow is often worn to create that “all night” gambler look. And a splash of cheap Scotch whiskey can do wonders. A back or inside pocket can be used to store the latest issue of Blackjack Review – essential reading for needed or planned breaks to the restroom. Leather wallet containing a session bankroll, false identiﬁcation, specially made business cards, and a respected lawyer’s phone number. Money belt and/or concealed compartments for bankroll and real identiﬁcation. The outer or side pockets are useful for loose change and a few hundred bucks — designed for tipping and quick hit-and-run transactions. The hand and ﬁngers are used to play the hands, side count aces and/or other cards, and pocket those extra chips when his stack gets too big. Cigarettes can be used to relay signals and the box is useful to hide strategy tables, cameras, tape recorders, etc. Casino chips are excellent for keeping track of the count, side counting, or to track the shuﬄe. Some players even tip the dealer occasionally with them. Electronic devices can been used to relay signals or provide IO to concealed computers. Electronic devices of this nature are highly illegal in many casino locals. Also, some of the other electronic devices mentioned on this page “may” also be illegal. Card counting is a highly skilled art form that does not require the use of electronic devices to gain an advantage. In general, these devices are not recommended as you may be barred from play or, worse yet, serve jail time if you are caught using them. * With apologies to all card counters (both male and female) who would never consider using an electronic device. Blackjack Review magazine encourages all players to avoid their use in favor of the one essential element that is required to beat this game… their brain!